Not a user yet? Register | Forgot your password? 1. First, you have to register as a new user, or log into the system if you are already registered. 2. Second, upload your compressed anonymized T1w brain MRI data in NIFTI format. Zip, Rar and Gzip compression formats are accepted. Most of MRI scanners produce DICOM data so a previous conversion to NIFTI format is required. There are many software packages that can do the job but we recommend dcm2nii (part of MRICRON software) which is a free and powerful tool. 3. Once your data is uploaded, volBrain will process your request as soon as possible and generate a report containing the results. 4. Finally, you will receive an e-mail informing about your request completion. The report will be included as an attachment, and you will be able to download a package including image files generated during the process. volBrain is a pipeline of processes aimed to automatically analyze MRI brain data. It works as a black box from the user point of view as it gets an anonymized MRI brain volume in NIFTI format and produces a pdf report with the volumes of the main IntraCranial Cavity (ICC) tissues (that is, CSF, GM and WM). It also provides volume information of some macroscopic areas such as brain hemispheres, cerebellum and brainstem. 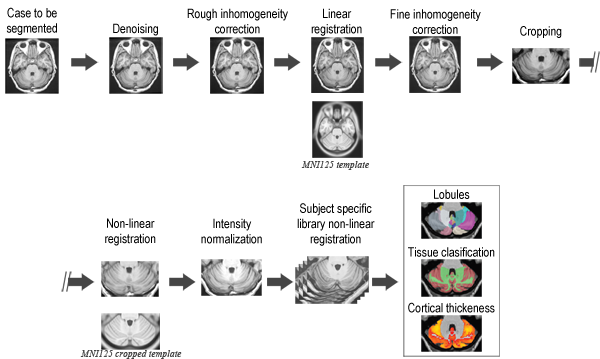 Finally, automatic subcortical structure segmentation is performed and related volumes and label maps are provided. The average processing time of the whole pipeline is around 12 minutes. However this time can vary depending on the number of jobs queued in our server. In the next figure a brief outline of the process is displayed. Intracranial cavity mask, hemisphere/cerebellum masks and Subcortical labels were manually segmented by our expert on a set of T1w MRI. This training library is then used to perform automatic segmentation of your new cases. All structures were outlined according to our expert definition (our Lateral ventricles definition did not include choroid plexuses) with the exception of hippocampus which was segmented following the EADC protocol. Once the process is finished you will be notified by e-mail so you will be able to download a package including some image files and two (CSV and PDF) reports gathering all the volumetry values calculated from the segmentations. As you can see in the figure below the PDF includes patient information, parenchyma, brain tissues, macrostructure and subcortical structure volumes and also asymmetry indexes. It also includes several snapshots from the different labelling results as a quality control. Ceres is a pipeline to automatically analyze Cerebellum MRI brain data. As for volBrain, it gets an anonymized MRI brain volume in NIFTI format and produces a pdf report with the volumes of the main cerebellum tissues (WM and GM) and the cerebellum lobules. It also provides cerebellar cortical thickness for each lobule. The average processing time of the whole pipeline is around 10 minutes. However this time can vary depending on the number of jobs queued in our server. In the next figure a brief outline of the process is displayed. 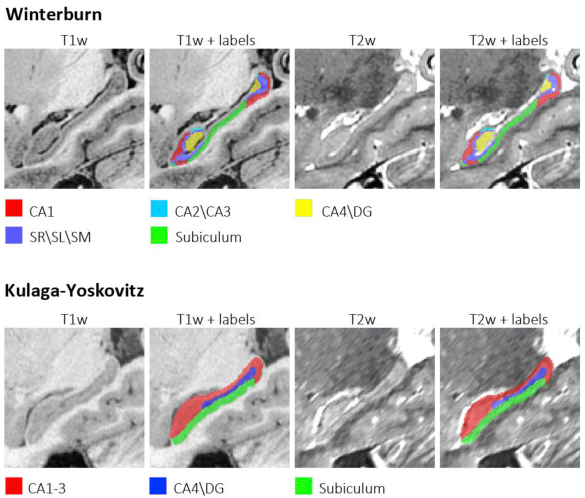 Cerebellum white matter and lobules were manually segmented by experts in a set of T1w MRI. This training library is then used to perform automatic segmentation of your new cases. All structures were outlined according to the definition described in Park et al., 2014 (see reference below). Once the process is finished you will be notified by e-mail so you will be able to download a package including some image files and two (CSV and PDF) reports gathering all the volumetry values calculated from the segmentations. As you can see in the figure below the PDF includes patient information, parenchyma, cerebellum tissues and cerebellum lobules volumes, cerebellum cortical thickness and also asymmetry indexes. It also includes several snapshots from the different labelling results as a quality control. lesionBrain is a pipeline to automatically segment white matter lesions from MRI data(T1 + FLAIR). As for volBrain, it gets two anonymized MRI brain volumes in NIFTI format and produces a pdf report with the volumes of the lesions and their locations The average processing time of the whole pipeline is around 20 minutes. However this time can vary depending on the number of jobs queued in our server. In the next figure a brief outline of the process is displayed. Once the process is finished you will be notified by e-mail so you will be able to download a package including some image files and two (CSV and PDF) reports gathering all the volumetry values calculated from the segmentations. As you can see in the figure below the PDF includes patient information, lesion clases , volumes and their locations in MNI space. It also includes several snapshots from the different labelling results as a quality control. HIPS is a pipeline for automatic hippocampus subfield segmetnation from monomodal (T1) of multimodal MRI data (T1 + T2). 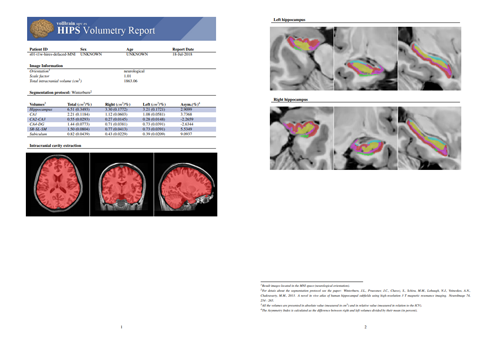 As for volBrain, it gets two anonymized MRI brain volumes in NIFTI format and produces a pdf report with the volumes of diferent subfields using two different delimitation protocols. The average processing time of the whole pipeline is around 20 minutes. However this time can vary depending on the number of jobs queued in our server. In the next figure a brief outline of the process is displayed. Once the process is finished you will be notified by e-mail so you will be able to download a package including some image files and two (CSV and PDF) reports gathering all the volumetry values calculated from the segmentations. As you can see in the figure below the PDF includes patient information, subfield volumes and their asymetries in MNI space. It also includes several snapshots from the different labelling results as a quality control. José E.Romero, Pierrick Coupé, José V. Manjón. HIPS: A new hippocampus subfield segmentation method. NeuroImage. DOI: 10.1016/j.neuroimage.2017.09.049, 2017. José V. Manjón, Pierrick Coupé, Luis Martí-Bonmatí, Montserrat Robles, Louis Collins. Adaptive Non-Local Means Denoising of MR Images with Spatially Varying Noise Levels. Journal of Magnetic Resonance Imaging, 31,192-203, 2010. NJ Tustison, BB Avants, PA Cook, Y Zheng, A Egan, PA Yushkevich. 2010. N4ITK: improved N3 bias correction. Medical Imaging, IEEE Transactions on 29 (6), 1310-1320. J Ashburner, KJ Friston. 2005. Unified segmentation. Neuroimage 26 (3), 839-851. Avants BB, Tustison N, Song G. 2009. Advanced normalization tools (ANTS). Insight Journal. José V. Manjón, Simon F. Eskildsen, Pierrick Coupé, Jose E. Romero, D. Louis Collins, Montserrat Robles. Nonlocal Intracranial Cavity Extraction. IJBI. Article ID 820205. 2014. José V. Manjón, Jussi Tohka, Montserrat Robles. Improved Estimates of Partial Volume Coefficients from Noisy Brain MRI Using Spatial Context. Neuroimage, 53(2), 480-490, 2010. José E. Romero, José V. Manjón, Jussi Tohka, Pierrick Coupé, Montserrat Robles. NABS: Non-local Automatic Brain Hemisphere Segmentation. Magnetic Resonance Imaging. DOI: 10.1016/j.mri.2015.02.005, 2015. Pierrick Coupé, Jose V. Manjón, Vladimir Fonov, Jens Pruessner, Montserrat Robles, D. Louis Collins. Patch-based Segmentation using Expert Priors: Application to Hippocampus and Ventricle Segmentation. NeuroImage, 54(2): 940-954, 2011. Giraud, R., Ta, V.-T., Papadakis, N., Manjón, J.V., Collins, D.L., Coupé, P. and Initiative, A.D.N. An Optimized PatchMatch for multi-scale and multi-feature label fusion. Neuroimage In press, 2015. Park, M.T.M., Pipitone, J., Baer, L.H., Winterburn, J.L., Shah, Y., Chavez, S., Schira, M.M., Labaugh, N.J., Lerch, J.P., Vineskos, A.N. and Chakravarty, M.M. 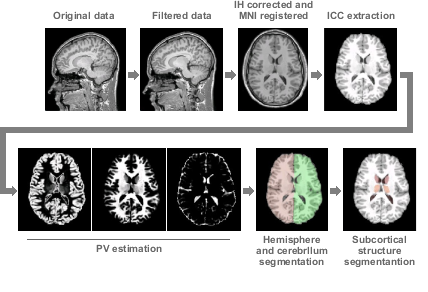 Derivation of high-resolution MRI atlases of the human cerebellumat 3 T and segmentation using multiple automatically generated templates. 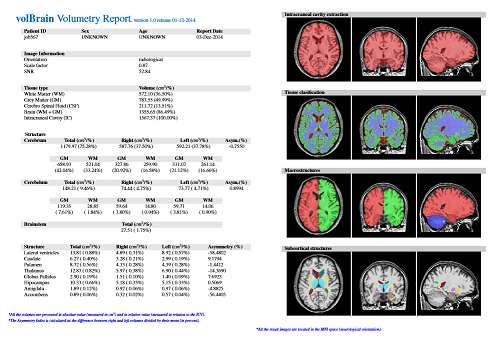 NeuroImage 95: 217 - 231, 2014. Tustison, N.J., Cook, P.A., Klein, A., Song, G., Das, S.R., Duda, J.T., Kandel, B.M., van Strien, N., Stone, J.R., Gee, J.C., Avants, B.B. Large-scale evaluation of ANTs and FreeSurfer cortical thickness measurements. Neuroimage. 99: 166 - 79, 2014. Pierrick Coupe, Gwenaelle Catheline, Enrique Lanuza, José V. Manjón. Towards a unified analysis of brain maturation and aging across the entire lifespan: A MRI analysis. Human Brain Mapping, 2017.